An ultrasound scan is one type of imaging test – a test that uses special equipment to create one or more pictures of part of the inside of the body. This topic gives general information. The way the ultrasound scans are performed will vary between different hospitals. 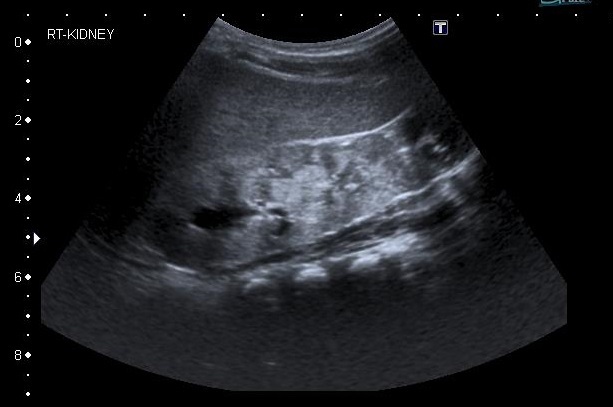 The ultrasound scan uses ultrasound, or high-frequency sound waves, to create an image (picture) of part of the inside of your child’s body, such as his or her kidney. You cannot hear ultrasound, but it can be picked up by special machines. Ultrasound passes through fluid (liquid) and soft tissues, and bounces back (like an echo) from more solid structures. This scan is also called a sonogram. Your doctor may recommend this for your child to diagnose a condition, sometimes with results from other tests, such as blood tests and urine tests. This helps find out why your child has certain symptoms or signs, and allows your doctor to consider the best treatment. It may also be used to find out how well a treatment is working. The ultrasound scan is very safe, because sound waves are not thought to harm the body. The scan does not hurt. Speak with your child about the scan, and what will happen. If he or she is old enough, explain what it is looking for and why it is needed. Your child does not usually need to do anything to prepare for this test, but your doctor will let you know. Sometimes your doctor will need to look at the bladder when it is full. Your child may need to have a drink of water shortly before the test and, if possible, avoid going to the toilet. The ultrasound scan normally takes place in the X-ray department of your hospital. A doctor or a sonographer, a specialist trained in the use of ultrasound, performs the test. Your doctor uses the information to help make a diagnosis. The scan usually takes about 15-45 minutes. Your child lies down. A gel is put on his or her skin – this may feel a bit cold. A small handheld device called a transducer is moved around your child’s skin – the gel helps it move smoothly. This transducer is attached to a computer and a monitor. Pulses of ultrasound are sent through the transducer and into the body – your child cannot feel these. These sound waves bounce back from the structures inside the body (like an echo). They are displayed as an image on the monitor (screen). Sometimes, an ultrasound scan can show moving images, like a video. Your child can usually go home straight away after the scan. Your child should not normally have any problems passing urine, see a change in the colour of his or her urine, or have any other problems. Speak with your doctor if you have any concerns. If your doctor performs the test, he or she may be able to give you information from the scan straight away. If a sonographer performs the test, he or she will send a report to your doctor. Speak with your doctor about when you should expect the results. Your doctor may also recommend a Doppler ultrasound scan. This measures how quickly something moves inside the body. For example, it can show how quickly blood is flowing through blood vessels, which can be seen on a colour screen. An echocardiogram is an ultrasound scan of the heart. It may also be called an ECHO. The transducer is moved around the chest, and images of the heart are displayed on the monitor. A Doppler echocardiogram can check the blood flow through different parts of your child’s heart.